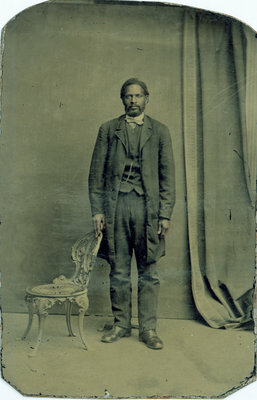 An unidentified gentleman sporting a handlebar mustache stands with a chair beside a curtain in this small black and white tintype photograph. The name of the photographer and the location of the studio are unknown. This tintype was among the family memorabilia owned by Iris Sloman Bell, of St. Catharines, Ontario. Relatives of the Sloman Bell families are descended from former American slaves who settled in Canada.